Happy Friday! Two weeks into the school year, and I am already living for the weekends. I crave those moments that we are all together, and even though during the school year weekends seem to be just as crazy as the weeks, at least all five of us are usually together. This week for Friday Favorites I am going to mix things up a bit. A sweet reader emailed us a few months ago asking for kind of a peek into our daily routines and our cleaning favorites. Carrie Beth shared her cleaning routine, and now that life has settled a teeny tiny bit and we are back home more, I thought I would share mine. I tried to keep my cell phone with me all day Monday so you could get a good peek. L.C. starts school today and a few more things will be thrown in the mix in the upcoming weeks, but otherwise it's a good look at the crazy around here. Wake up time. Every single day. I will never ever complain about 7:00a.m. wake up calls ever again. After I've rolled out of bed, brushed my teeth, and determined that I can function, I head downstairs to finish out making lunch boxes. I pack The Cutes lunch boxes the night before and then I add the refrigerated stuff in the morning. After lunch boxes, I unload the dishwasher and start a load of laundry. I begin making breakfast for The Cutes. Baby Cute is still inconsistent in when she wakes up and when she does she is hangry so I try to make sure everything is already made and ready to go before I wake the older two. Wake up time for Cute! He's wide awake and speaking 100 miles an hour. I employ caffeine, and get Cute dressed and fed. He usually eats pretty fast so sometimes we can snuggle on the couch for a sec and talk, and sometimes we go over any special work he might have for the day ahead. We grab backpacks, and head out the door to the bus stop. The bus stop is only one house down from ours. If the girls are still sleeping I let them sleep, and if not, we all send off Cute together. I've learned the bus isn't the most punctual thing so far, but fear testing that one day. I make my way home and then grab my breakfast if Baby Cute still hasn't awakened. If she's up I nurse her first and then eat. On this day, I fed her first and then ate one of my favorite breakfasts - So Delicious yogurt (the Raspberry one is yum!) and turkey sausage. Rarely is anyone sleeping beyond this time. I let the pups out, we all give them some love, some breakfast, and their daily meds. Currently we have my father-in-laws dog Oscar with us, and L.C. loves tending to his every need. If treats are involved Oscar seems okay with this arrangement. Please excuse the sunscreen L.C. decided needed to be added to our meal. Luckily our favorite chicken in a crockpot meal was spared and she only got it on the side. At this time I employed a caffeine refresh. I switch the laundry over and answer my emails. L.C. does a pajama outfit change (it happens a lot through out the day) complete with flip flops, and sits to watch the Olympics with me. She too has become Olympic obsessed just like the rest of us. Gymnastics is by far her favorite, and if I could share the video of her copying the routines she watches I totally would. Let's just say her skills are on point. Theatrics and drama she definitely has down. I let the girls play, and I get dressed. Monday's equal a little athleisure attire. Baby Cute is back down for her morning nap. 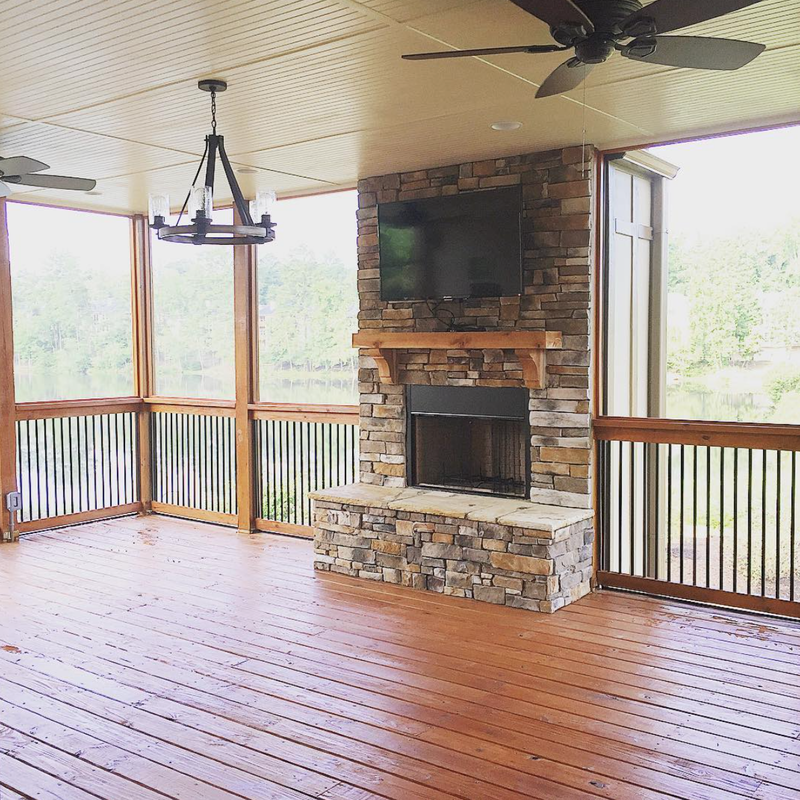 Contractors for Project Deck arrived and did about 7.5 minutes of work before calling it quits for the day. Stay tuned on this for an update soon. Nurse and change Baby Cute. Out the door for some quick errands. My top priority was getting Baby Cute her food. I can't believe how hard it has been to find Stage 1 baby food. Are babies not doing this anymore? Is there some sort of shortage on pureed carrots that I haven't been privy too? We grab some of my favorite brand of baby food and then head out to feed those of us who like solids. Chickfila for the lunch win. Baby Cute is hungry again, so we nurse again. Lunch is cleaned up, and we start some chores. It was dark and thunderstormy on Monday or we would have been outside playing. We head to get Cute off the bus. It's tough living the toddler life. Do homework with Cute. Luckily it's the beginning of the school year and we don't have much yet. While everyone is quiet I use this time to blog and catch up on emails, bills, and other fun adult stuff. Cute usually is in his room playing with his Legos, Ninja Turtles or reading for a little more wind down time. I also might or might not sneak a little caffeine in here as well. Needed currently for survival - double yes. I make sure everyone is wide awake and we head out the door for karate. And yes, we rock the Halloween plates year round. The Cutes play, and I feed Baby Cute her dinner. She's in her pjs already due to an unfortunate diaper change. Prayers were said that dinner time wouldn't get too crazy. Now this is where I've learned it feels like sprinting at the end of a marathon. Both Carrie Beth and I have traveling husbands during the week and we are 3v1 at bedtime. My kids get super amped at this time of day. Sometimes its hilarious and some days not so much. Luckily this day everyone was in a great mood. Baby Cute required a post dinner bath. I nurse her to sleep while The Cutes are reading stories in Cutes room. L.C. is asleep in bed. Cute is almost asleep. I walk down the hall to get my pjs on. L.C. wakes up needing water. Cute hears someone is getting water and also now needs water. Giggling is coming from L.C's room. I wonder if I have wine chilled. I get L.C. settled and finally asleep. Cute now has to go potty. I finally sat down and watched the Olympics while leisurely enjoying the fruits of my mad crockpot skills. I clean the kitchen, vacuum the floor, fold the laundry, let out the dogs, and get lunch ready for the next day. If I have any energy left from the day this is when I will try to also hammer out a quick run on the treadmill or a workout. On Monday I decided to skip. Mommy was tired. I snuggle in and sign off for the day. Now Little Cute and Baby Cute both are consistently waking me throughout the night. This is new for L.C. and she likes to make sure everyone knows she's awake. In the entire neighborhood. Usually this is anywhere from 2-6 wake ups a night between the two. Now I mentioned I cleaned a lot throughout our day, but Tuesday is usually the day I finally get a large block of time to clean. I love having a super clean organized house, but living with my husband and kids I've had to come way down on my expectations. I have no consistent cleaning routine only because if it is messy or needs to be cleaned I do it right then. I can't stand looking at dust for two days because it isn't "dusting day". Vacuuming and mopping is my biggest thing. 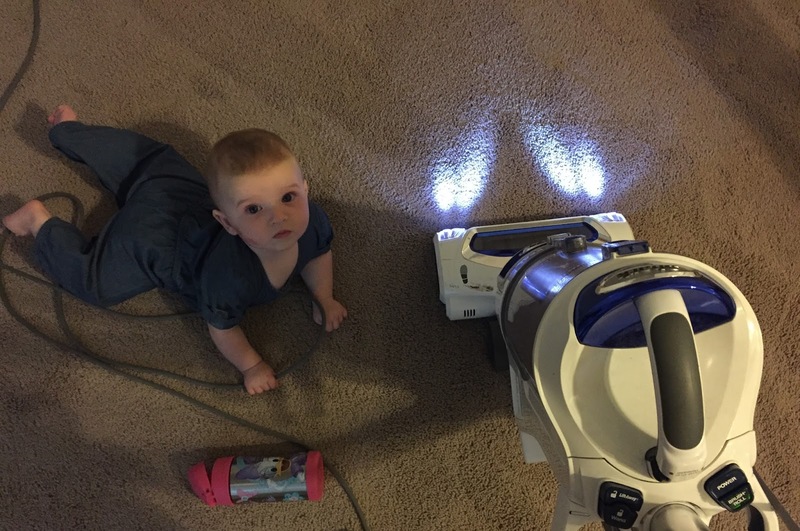 I usually vacuum twice a day because I can't stand dog hair on the floors - especially with a baby crawling on them now. I love Method cleaning products and use them in almost every room in my house as well as my floors. They just smell so good and I love that they are natural safe products. In the Cutes bathrooms I keep Babyganics cleaning supplies. I use those for both their bathrooms and their rooms - I especially like the Babyganics quick wipes. For clean floors I enlist two major helpers. My Roomba that we both have raved about this year, and my absolute favorite vacuum I've ever owned. You see me using it above, and it is the best one I have found (and I've gone through a lot with our Labs) that combats pet hair and is still super versatile to use. If you are in the market for a new vacuum I highly recommend. For dusting, I have quite a few favorites. I love my E-Cloth glove. 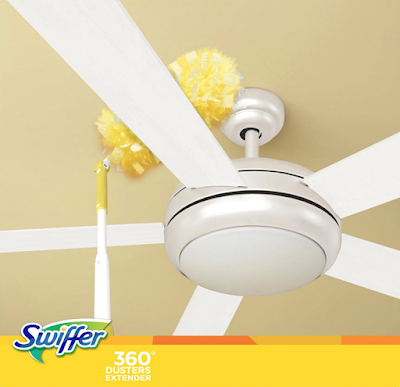 It is super handy for a quick dusting, and especially in those awkward places like blinds. I can knock out my blinds in just a few seconds and then once I am done the E-Cloth glove itself can be cleaned for its next use. It's also great on top of surfaces - just a swipe of your hand and done! The E-Cloth glove is definitely one I would stick in your cleaning arsenal. And just for fun, we've partnered with the lovely E-Cloth makers to giveaway one glove to a lucky reader. While we might not like cleaning, at least we can all have some fun favorite products to make it go a little smoother! Winner will be chosen via random.org and announced on Friday, August 19th. Now off to a weekend filled with more Olympic watching. Great post! I did a similar one this week too, & I had to set my alarm to remind me to snap pictures! Haha thanks for sharing. Looks like y'all had a great week! I love the method products too, I think the scents help make it fun to clean the house and more enjoyable. Whew! I'm tired after reading this post! I Love my swiffer stick vacuum! Really I love it because the boys fight over who gets to run it, so they clean up the crumbs... It's a win win! I really love Four Monks Vinegar cleaner. It really cleans and is natural- no chemicals. I live by using my Swiffer Wet Jet for both linoleum and hard wood floors! And WOW would love to win this giveaway! My favorite cleaning product is my cordless Dyson. I love how light it is, and that I can quickly vacuum the entire house without replugging! I keep hearing great things about the Dyson! Congratulations you are our winner! Please send us an email with your contact information and we will get your prize out to you shortly! I love Orange Glo to dust and polish furniture. Makes everything nice and shiny and smells amazing too! I'm amazed at how much you get done before 6am. Holy Moly. I love day in the life posts. You are a rockstar!! My favorite is Lysol wipes! I would be lost without my Magic Eraser. I clean everything from shoes to showers with those fabulous scrubbers. love love love our Shark Rotator! Have been wanting to try e-cloths!